About a year and a half ago, I met Mike Ball down at the Tap Shack, a little hole in the wall bar in downtown Carson City. 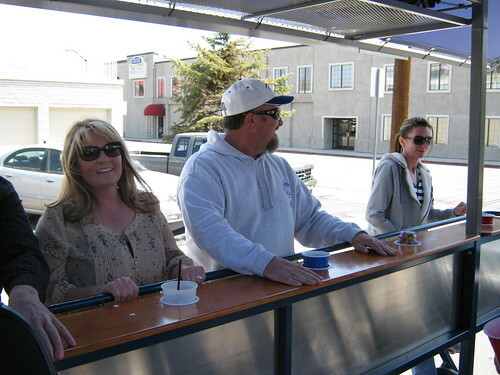 He and a couple other of my friends were discussing building a bar on wheels that could be pedaled around town. While it sounded very cool, I passed it off as one of those crazy ideas that bubbles up after a few pints of beer. Something akin to quitting your job and backpacking across Spain, or the ultimate bank heist. It sounded like too much effort to me. But much to my surprise, months later, I found myself pedaling Mike’s new Cycle Pub down main street last weekend, laughing, drinking a beer, honking the horn, and waving at all the people we passed. 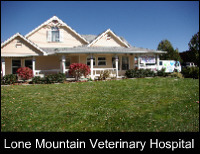 In the end, Mike decided not to reinvent the wheel, and visited Bend, Oregon. 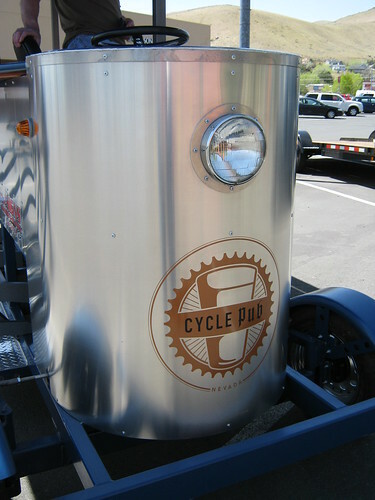 They already have a successful Cycle Pub running out there, and Mike had them build him one. 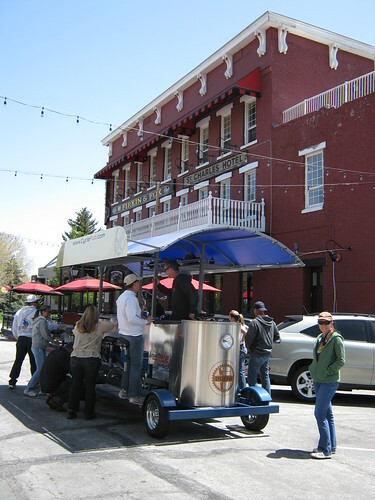 Cycle Pub Nevada arrived in Carson City in early April, and now Mike is drumming up business. This shouldn’t be too hard, judging by the reactions we got as we pedaled the pub around town. So what is a Cycle Pub? 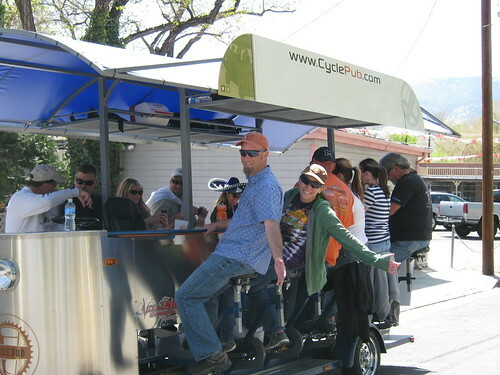 Think of your favorite bar combined with an old time cable car combined with your bicycle. There are six seats on each side of the cycle pub, and 10 of these seats have pedals. Each side of the pub has a driveline, and together they work to push the vehicle forward. There is an additional bench seat on the back of the pub that comfortably seats two. 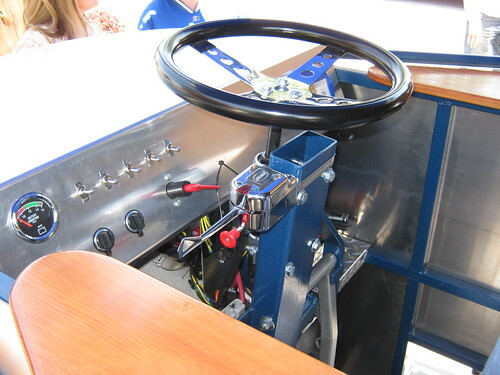 The captain of the Cycle Pub does all the steering, braking, traffic signals, and calls to the engine room for More Power! The captain of the Cycle Pub does not serve alcohol (nor does he or she partake), but the patrons are welcome to bring their own. Ice chests are on board to store the bottles and cans, and your beverages may be poured into plastic cups for enjoyment while in transit. No glass is allowed while the Cycle Pub is in motion. 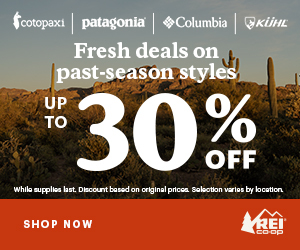 Overhead bins are available to store jackets, bags, snacks, and other gear. Just don’t forget to hold your cup when when the captain yells, “Bump!”, or you may find yourself wearing your drink. So what’s it like to ride the Cycle Pub? 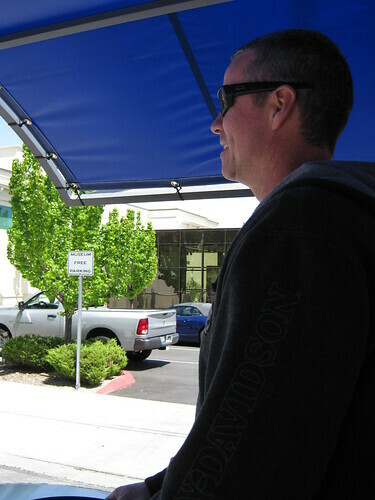 My wife Kristy and I boarded the Cycle Pub shortly after noon at the Carson Mall. We brought a few beers and a bag of ice for the ice chest, and our extras were stowed away in the overhead bins. Some of the passengers had brought iPods to plug into the Cycle Pub’s sound system. Every party needs good music. 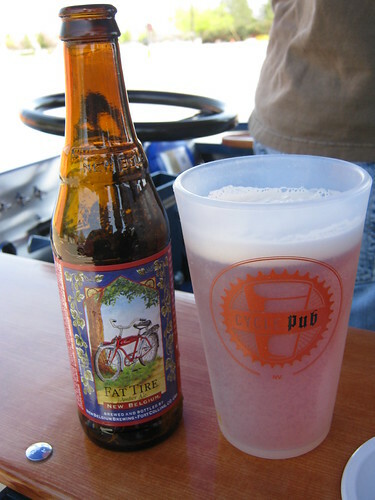 Before departure we filled up our plastic cups with some Fat Tire Ale, and were ready to hit the road. As the rolling pub gets moving from a standstill, you can feel the weight. 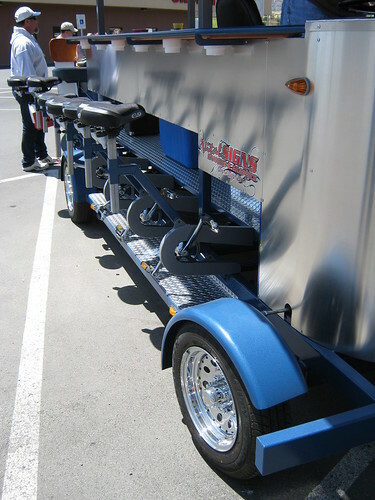 All 1,600 lbs of it plus the weight of the passengers and cargo! Only a few revolutions of the pedals later though, inertia takes over, and you begin to spin rather easily as long as the ground is flat. 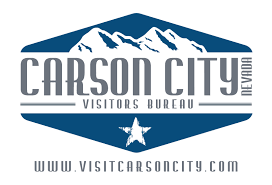 Thankfully, flat describes Carson City rather well, and the only real hills we encountered all day were the sloped drainage areas entering and exiting parking lots. One thing is for sure though, you really get to know the contours of the city. Your legs will feel the slight uphills even though your eyes might not see them, and at times, you may even do a quick check of everyone’s legs to make sure they’re pedaling too. On the flats or downhill though, the Cycle Pub with it’s single speed gearing just coasts along without much effort on your part. There is no reverse on the pub, but it just took a few of us to push it out of a parking place and back on the road for the next ride. 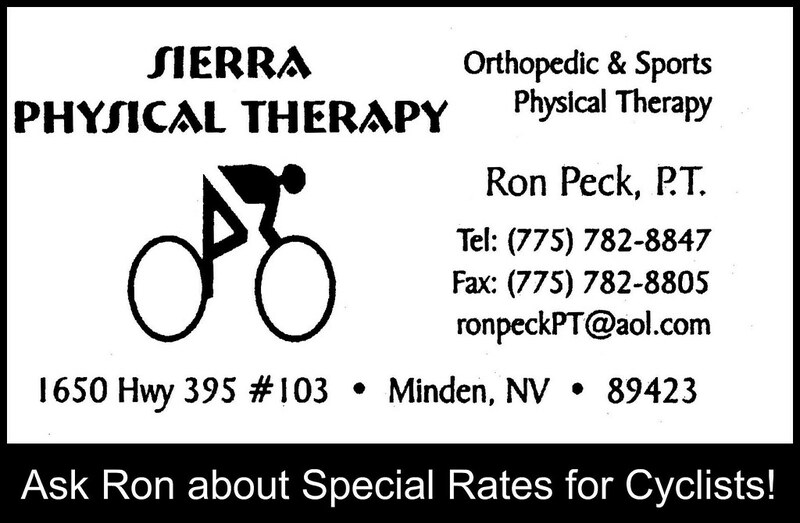 Even though there may be some hard pedaling efforts at times, it doesn’t last very long. Before you know it you’ve reached the next stop, one of the many you’ll be making along your journey around town. 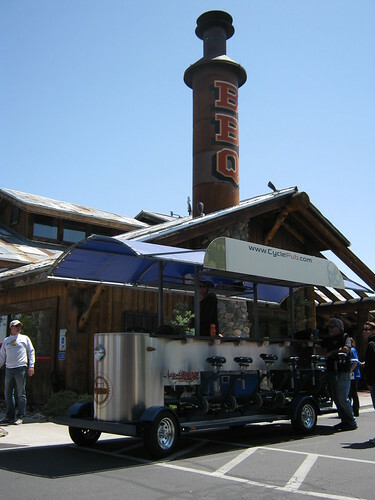 This gives you plenty of opportunities to refill your cup, sneak a bathroom break, or even grab a bite to eat. Kristy and I got a couple burritos to go from Playa Azul at one stop. 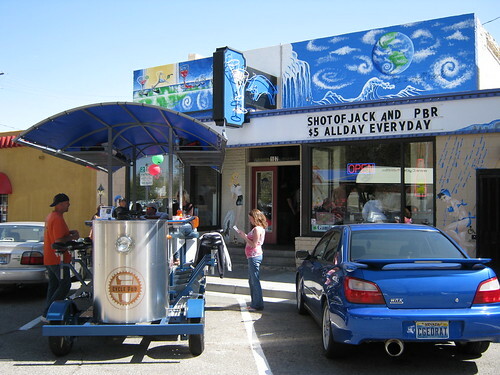 Simultaneously pedaling, sipping a brew, and eating a burrito…a few of my favorite things all in one place! A great ride through downtown! The Cycle Pub is definitely a party. Whether parked or rolling down the road, everyone wants to see what you’re up to. 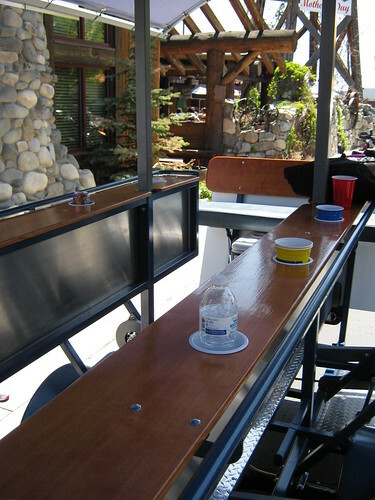 Many folks on the Wine Walk stopped by the Cycle Pub to chat and marvel at the rolling bar. I didn’t see anyone that didn’t have a big grin on their face. While pedaling down main street, all the motorists were patient with our slow pace, and almost everyone waved and smiled as they passed. 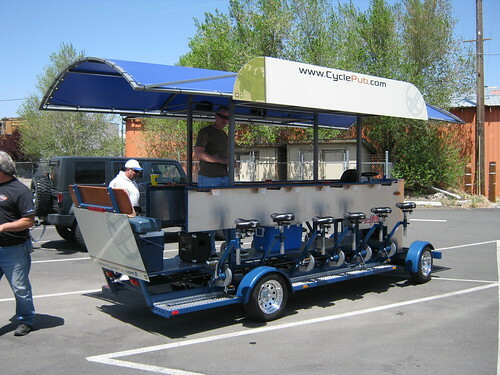 By the end of the ride, everyone on board the Cycle Pub had become friends. It’s definitely a good team building exercise, even among strangers. Sound like fun? Of course it does! Below is the info you’ll need to book your trip on the Cycle Pub! Get 10-12 of your friends together to share the cost and the pedaling chores, and don’t forget your iPod and favorite drinks and snacks. 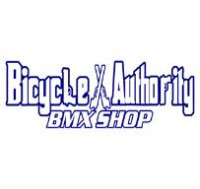 If alcohol is being served, all riders must be 21. 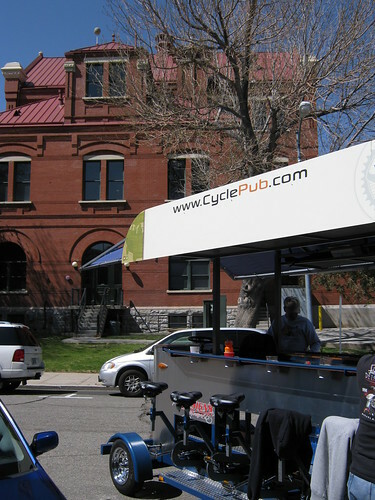 Also, look for the Cycle Pub to make an appearance at the May 16th evening Cruiser Ride, and at the Bike to Work Week Party at the Firkin and Fox on May 18th!